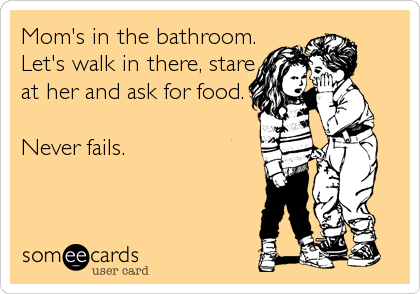 Ah the days when the bathroom door was solely there to give you privacy from the outside world, in other words SHUT! Might have been a revolving door in some homes with large families and often slammed if there was only one that was meant to be shared with you and anyone other than you. But it was constantly shut and often locked, let our siblings bang all they want, they are not getting in while I take my 45 minute unnecessary shower! We depended on the door to do its job and remain shut when we shut it, locked when we locked it and prayed it is not made out of thin particle board. 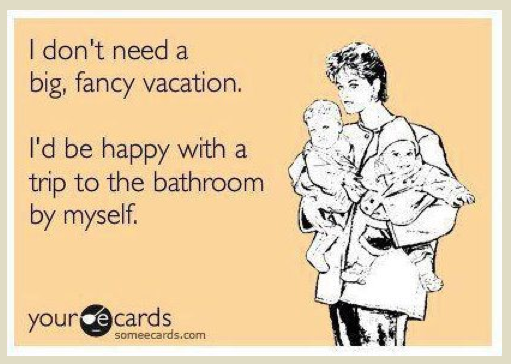 When our idea of being pampered is being able to use the restroom in private or in peace we know we have reached the status of being a MOM! When we do shut the door for the first time “on them” their reactions are priceless. HOW DARE SHE! Little fingers appear under the door frame, trying to see if they can reach us or finding a weak spot for later bathroom uses. Cold tile will not stop a toddler who wants in, they will sit in front of the shut door waiting……and waiting for US. Sometimes screaming and crying, other times talking to us and the moments I would worry most about — for myself– was when they would sit there facing the door BEING QUIET! You know their brain is thinking, turning inside. And when we open the door it is the same reaction we receive when we get home and our dog greets us…..no concept of time, they are just pure happy to see us. My little boys who would once do this are now teens, they respect me and never do this now. Now my girls, 5 & 6 they will instead yell LOUD from way outside my bedroom door, MOM CAN I GET A CHEESE STICK? MOM THE BOYS ARE FIGHTING. MOM CAN I COME IN? MOM WHEN ARE YOU GOING TO BE DONE? MOM I AM HUNGRY. MOM….. MOM….. MOM….. MOM…..
“OKAY MOM I WILL WAIT RIGHT HERE FOR YOU.” they do, they just check in every 2.1 seconds. LOL. Oh bathroom door I took you for granted for decades and now I just wish I could afford a sound proof one. 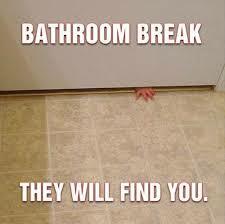 More breaks happen in the bathroom by kids to moms’ than houses. Deadbolts need to be on bathroom doors! Thank you for allowing me to be a guest blogger on your wonderful Blog! Truly one of my favorite blogs, and I enjoy reading your post nightly. Very glad we meet up on Instagram. This is very true and very cute! Privacy? What's that! ?